For the past few decades, science and technology have been growing at a very alarming rate. Humanity has experienced great advancement in technology. Nigeria is not left out of this development. In Nigeria, technological advancement led to the birth of lots of online shopping stores. We have a lot of online shopping stores, and this article is here to examine the Top 10 Online Shopping Sites In Nigeria. Just as the name says, Hello Food primarily sells food. This online shopping store partners with a good number of restaurants. You can select which food you want to buy and also which of the restaurants you want to buy from. You can order a wide range of local dishes including Fufu, Iyan, Amala and Eba. You can also order for cake, spaghetti, and pizza. HelloFood however, sells other items like computers, clothes, and laptops. The online shopping website has its primary physical presence in Lekki area of Lagos State. You can also make payment on delivery. Dealdey is an online shopping website that sells primarily on wholesale. The online shopping store is well-known for its fast delivery. Dealdey is also known for using a highly secure website for its business. The online shopping store sells a wide range of items, some of which include: shoes, clothes, perfumes and home appliances. Dealdey sells at very cheap prices. The online shopping store is however arguably one of the best in the country. Gloo differs from most of the online shopping stores on this list because its primary items being sold are different from the common smartphone, laptops, desktop computers, etc. Gloo is well-known for selling the following: local and foreign books, office appliances, foodstuffs, groceries and home appliances. This online shopping website allows customers to pay on delivery. When a customer buys items above eight thousand Naira, the delivery will be free of charge. Payporte is just another great online store in the country. This online store sells a wide range of items including clothes, foot wears, perfumes, smartphones and fashion items. Payporte has an excellent delivery system and sells its items at very affordable prices. Payporte operates physically from Lagos State. 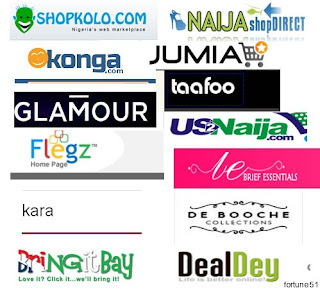 Kara is an online shopping store which serves every state in Nigeria and also Abuja. The primary items sold by this online shopping store include power systems, desktop computers, smartphones, laptops and home appliances. The most used payment method used by this shopping store is the online payment with debit cards. Here lies another popular online shopping website which has its primary office located in Lagos State. Kaymu has its primary office located in Lekki area of Lagos State. Kaymu sells a wide range of items including smartphones, pieces of jewelry, home appliances, vehicles, laptops and desktop computers. Kaymu is also known for its payment options. Its payment options include internet payment, bank deposits, and payment on delivery. Taafoo is a good online shopping site that has been in operation for some time. Although Taafoo is not as large as giants like Jumia and Konga, it's however one of the best in the country. Taafoo is considered one of the best primarily because of its excellence in its business operations. It has a fast delivery service. Items are sold at very affordable prices and it employs multiple security techniques on its website. Mystore is just another popular online shopping site in the country. Anyone from anywhere in the country can purchase items from this store. The store is well-known for its highly secured website used for its business transactions. The store sells a wide range of items including smartphones, computers, fashion items, home appliances and electronics. Mystore has its primary office located in Lagos state. After Jumia comes Konga. Here lies the second best online shopping site in Nigeria. Konga is a very big online shopping site in the country. It operates in every state of the country. This online store sells the following: laptops, desktop computers, computer accessories, electronics, books and home and kitchen appliances. Jumia uses a very secure website for its customers. Here comes the giant Jumia, known by a lot of Nigerians. Jumia is no doubt the best, and it tops the list of top 10 online shopping sites in Nigeria. Its excellence lies not only in the quality of products and other services but also its delivery. Jumia has a very user-friendly website. Its website gives online shoppers a great user experience. Jumia sells a wide range of products including smartphones, laptops, fashion items, drinks, and electronics. That's all on the top 10 online shopping sites in Nigeria, we would love to know your opinions and experience with any of these websites, through the comment section. nice one wizy, but hope they are all legit online shop.